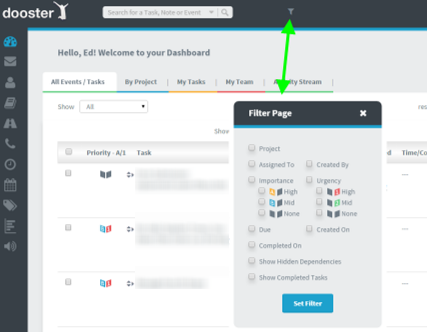 You can use filters (see image below) to produce a wide variety of data views – in your Dashboard and Project overview screens – or for your reports. As with all Dooster reports you can print the results (more info) and/or copy and paste the data onto spreadsheets. Use the Multiple Action select feature (read more) in combination with your filters for extra power !